It has also strong objections over increase in quota of private tour operators and reduction in Embarkation Points for Hajis as recommended by a special panel. NEW DELHI: The Haj Committee of India (HCOI) wants the government to not scrap the Haj subsidy immediately and to abolish it gradually by 2022, as has been recommended by the Supreme Court. It also has strong objections over increase in quota of private tour operators and reduction in Embarkation Points (EPs) for Haj pilgrims as recommended by a special Haj committee, which submitted a draft policy to the government recently. The HCOI is also against the proposal of abolishing reserved quota for applicants above 70 years of age. However, there are many suggestions of the special committee that the HCOI has approved. 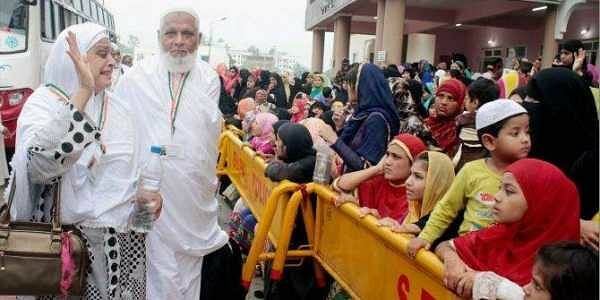 Among them is the proposal to allow women above 45 years of age to perform Haj without a mehram (a close male relative) and the proposal to abolish the reserved quota for fourth time applicants. Presently, applicants who fail to get Haj seats even after submitting applications four times automatically get a seat fifth time. The HCOI has also welcomed the committee’s suggestion that a global tender be invited for arranging air trips to Saudi Arabia. Chairman of HCOI Chodhary Mehboob Ali Kaiser spoke to The New Indian Express on Tuesday after a two-day meeting of top officials of Haj committees of various states and UTs. The HCOI will submit the memorandum to Ministry of Minority Affairs, which will hold a review meeting on the Centre’s proposed Haj policy on November 2. The review meeting will be attended by Minister for Minority Affairs Mukhtar Abbas Naqvi, senior officials of MEA and HCOI. “We have prepared a detailed memorandum on what the HCOI and the Haj committees of all states and Union territories feel about the proposed Haj policy. If the special committee’s report is implemented, then the Haj subsidy has to be removed by next year, but that is not how the government should proceed. We will ask the government to abolish the subsidy only by 2022, as suggested by the Supreme Court,” Kaiser said. He added that some issues raised in the memorandum have been discussed with Naqvi. “The minister has agreed that reduction of embarkation points for sending Haj pilgrims from India to Saudi Arabia will cause inconvenience to Haj pilgrims. The minister has also been positive on continuing reserved category of Haj pilgrimsof 70-years and above,” Kaiser said.